View Poll Results: Did Tyrannosaurus Rex had feathers? Thread: Did T-Rex had feathers? #1 Did T-Rex had feathers? Hi again everyone,<br><br>I just finish reading wikipedia about T-Rex and i read it could have feathers.<br>What do you think of it,could Tyrannosaurus Rex be feathered like dromeosaurus? you want feathers on your T.rex ? how about this one ? The evidence is based on the position of Tyrannosaurids within the theropod clade, with clades basal and more derived then the Tyrannosurids having been found with feathers. Therefore, unless the trait arose independently in the bracketing clades, or the Tryannosurids secondarily lost the trait, they had some degree of feathering. Would scales (like snake scales) be some degree of feathering? Scales=/=feathers, though its probable that there was a mix of scales and feathers, as is still seen in modern birds. So you are saying that scales and feathers are just different morphologies of the same thing? Does one tend to precede the other? No, I'm saying feathers are not (=/=) the same as scales, even though they do occur on birds together. It's a shame that english keyboards don't come with a "not equal" symbol. Is there a source that explains the relationship (if any) of scales with feathers? Feather origins are still not well understood, and the older hypothesis that they evolved from scales is falling out of favor. Feather - Wikipedia, the free encyclopedia There is an overview of the concepts in the Evolution section of the Wiki Feather article. Did you mean to say scales feathers? We might also ask how useful feathers would be. The first feathers were around the crotch and insides of forelegs, suggesting (to me at least) they were for brooding eggs. If that be so, such feathers are a blatent sexual trait and so the focus of sexual selection. Then sexual selection would tend to evolve feathers far beyond their original utility... i.e. a dinosaur so sexed up with plumage it lifts off in mating display. Are brooding feathers useless to T.Rex? Does it have sexual traits overshadowing feathers? 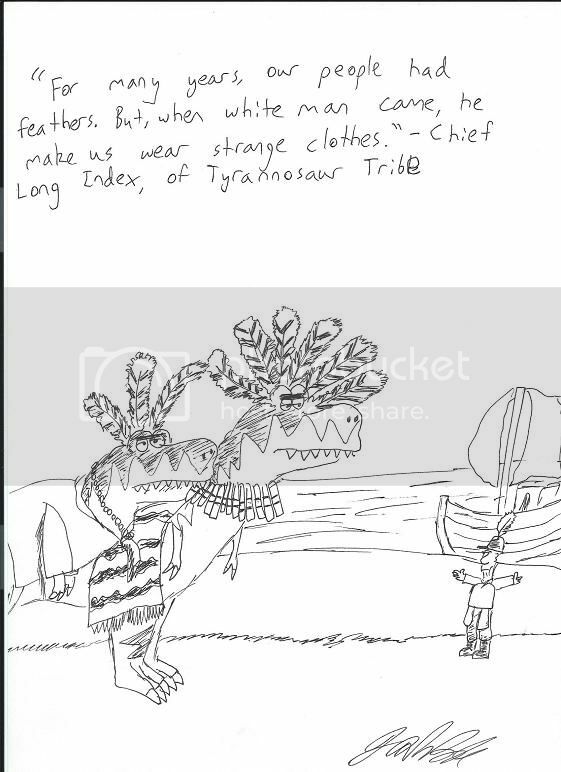 Whats your source for the assertion that protofeathers were first grown in the crotch region of dinosaurs? None. I don't mean feathers in the crotch, as with human pubic hair. I mean feathers from the base of the tail and upper hindlegs... that would certainly cover eggs if the dinosaur broods them. Personally, I've always rather fancied the notion that as well as having feathers, T Rex might also have HOPPED, like some monstrous kangaroo. This in my opinion would be grotesquely nightmarish - like a huge and terrifyingly carnivorous blackbird. I realise there is no evidence it would have done this but the combination of the mundane with the exotic could make an excellent horror movie. Whats your source for the assertion? Sorry I can't find the crotch-region thing, and all my searches come up Miley Cyrus. Anyway my point is that feathers may have initially helped shelter a nest, and I'll defend that. In the few examples we have, if you imagine the coelurosaur brooding her egg clutch, the feathers do a good job. Refute this by finding an example of early feathers which wouldn't help cover a nest. Also, I think you accept the earliest feathers were probably downy or like whiskers - it is obvious those draped over an egg clutch protect it better than a bald bottom. @exchemist. Maybe Rex didn't hop, but by flipping that massive counterbalance tail it could propel a downward bite with great speed. That's a sudden strike through the canopy to creatures our size. Then it could flip its tail again to power an upward rip and maybe toss small prey into the air before gravity sends them down the throat. See the original King Kong, when Kong curiously sniffs and nibbles a wriggling man. There is no evidence that the protofeathers first evolved in the crotch/leg regions. The early feathers seem to have been quill like and simple. And most often it is suggested that they were for warmth of the adults. NO its not obvious that they were for egg covering, as is clearly exemplified by the LACK of that assertion by the vertebrate palaeontologists that study the fossils. So the onus is on you to provide the evidence that your suggestion is better suited then the already existing knowledge. my point is that feathers may have initially helped shelter a nest, and I'll defend that. Why? And with what evidence? Thanks. The fossils bearing feather traces seem to show an arrangement that, besides other possible uses, would drape over the animal's nest. I mean, it would have to get into a weird position for the feathers not to cover the eggs. Maybe that's because of how the fossils are flattened? I welcome examples of feathers that wouldn't cover a nest, e.g. radiating dorsally. What are you trying to accomplish? I'm not challenging our existing knowledge. And you're well aware vertebrate palaeontologists LACK not only my assertion (interpretation) but have no sure ones of their own either for why feathers appeared. So you know I'm not contradicting anybody. There is no evidence that the protofeathers first evolved in the crotch/leg regions. The only hard evidence we have is from fossils with already full-blown feathers, unfortunately. In those we see feathers around the base of the tail and upper hind legs, apparently in a lateral pattern. I know it's kinda unimaginative to assume protofeathers were most likely there too. But even I wouldn't say let's put them elsewhere to suit my hypothesis. What am i trying to accomplish? Im trying to get you to actually detail and show the supporting evidence for your suggested hypothesis, which as stated, was that feathers evolved for egg care. What species are you referring to in your statements regarding the fossils you have seen? You are not currently doing science, you are starting with a preconceived idea and trying to make the evidence fit it. Thats not how it works. Then to compound matters you are presenting it as a much more solid hypothesis to the readers then it actually is. The so-called archaeopteryx of course, plus more recent finds like velociraptor; typically from China. I'm referring to all skeletons with feathers. If you pose these like an incubating oviraptor - assuming they did brood their eggs - the feathers just happen to shield the nest. You are not currently doing science, you are starting with a preconceived idea and trying to make the evidence fit it. No, I observed the arrangement of feathers in our various species has this in common, that supports the theory they brooded their eggs. Are you disputing that covering eggs with feathers amounts to brooding? Or that the feathers of our samples would not cover the eggs? No need for feathers to grow in the crotch itself, though unless the animal sweats (because the added surface area helps evaporate moisture). Also I don't think chickens have much in the way of feathers down there. The feathers in that region are more like hairs than feathers. Yeah. If you warm the adult, then you warm the egg. And the purpose of feathers/hair/etc is to prevent heat transfer. Well, when a hen sits on its eggs, the last thing it wants is a barrier to heat transfer between itself and the eggs. It's trying to heat them, after all. The nest, on the other hand, should be as insulated as possible. I know very little about thermoregulation in birds and reptiles, but everything you said makes sense. So, for purposes of incubation, the animal should not be insulated where it touches the eggs. How convenient, for many reptiles do press their bellies against surfaces they want to exchange heat with. Insulated how? With what? Bunnies rip their own chest hair for nesting, birds their own feathers. A very adaptable dinosaur like tyrannosaurus rex can't rely on specific plant resources for bedding. 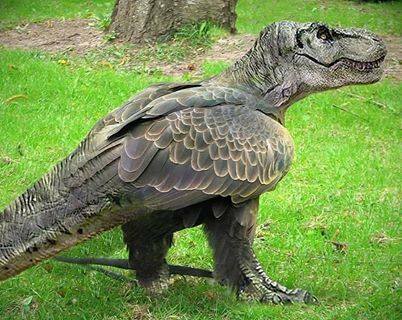 Another interesting possibility for a T-Rex, though, might be to tear feathers off of its prey. It does have those little clawed hands. The forearms had no opposible digits though so no way of "plucking foods. And the most common prey animals would have been the featherless herbivores of the Cretaceous, hadrosaurs and ceratopsians. Also for animals in the tyrannosaur size range, they more likely employed techniques like modern sea turtles and saltwater crocodiles. nest building with soil and plant materials. Yeah. There are some big holes in the theory of feathers being part of egg warming. Another is just the plain large size of the T-Rex. The bigger the animal the easier it is for them to heat themselves, because large size gives a favorable volume-to-surface area ratio. At least warm blooded animals benefit from being large. Cold blooded animals face the exact opposite of a benefit, because they need a favorable surface area -to - volume ratio in order to absorb more heat from their surroundings. Scales make a cold blooded animal's skin have more surface area (although not by much). They conduct heat instead of blocking the exchange of heat. So, if you think about it, feathers are the natural direction reptiles would evolve toward once they became warm blooded. Warm bloodedness, in turn, is a natural direction for a cold blooded creature to move in after they start to get really big. The growth in size would have been motivated by abundant food, which ultimately served as the catalyst for everything else.